Neuropathic pain (NP) is a complex type of pain initiated or caused by a primary lesion or dysfunction in the nervous system. It is defined as pain arising as a direct consequence of a lesion or disease affecting the somatosensory system at either the peripheral or central level. Damage can be caused by trauma, surgery or disease processes including diabetes, infection (eg after shingles infection - post-herpetic neuralgia) and cancer. Following a peripheral origin, central sensitization may develop as a result of ectopic neuronal activity in the spinal cord dorsal horn, implying a potential autonomous pain-generating mechanism. There are many reasons that patients may develop neuropathic pain however, on a cellular level, one explanation is that an increased release of certain pain signalling neurotransmitters, combined with an impaired ability of the nerves to regulate these signals, can lead to the sensation of pain originating from the affected region. Additionally, in the spinal cord, the area which interprets painful signals is rearranged, with corresponding changes in neurotransmitters and loss of normally-functioning cell bodies; these alterations result in the perception of pain even in the absence of external stimulation. In the brain, the ability to block pain can be lost following an injury such as stroke or trauma. Over time, further cellular damage occurs and the sense of pain persists. Peripheral neuropathy first develops in the longest nerves of the body in a "glove and stocking" distribution to the hands and feet. There are numerous causes of peripheral neuropathy, including certain hereditary conditions, viral diseases, liver or kidney failure, and toxins, as well as diseases such as diabetes, vascular disease, and rheumatoid conditions. Peripheral neuropathy can be motor, sensory or autonomic in nature. Phantom limb pain occurs in some people after the amputation of an arm or leg. Although the exact cause of phantom limb pain is unknown, it appears to result when the nerves and the brain send faulty signals to the limb as the circuitry attempts to "rewire" itself. Post-herpetic neuralgia (PHN) is a type of nerve pain that can occur following a viral infection of herpes zoster "shingles" in the nervous system. Post herpetic neuralgia aching or stabbing pain occurs in areas where the shingles rash developed. The skin in such areas may feel extra sensitive, especially in white-colored scars. Trigeminal neuralgia (TN) is a cause of severe pain in the face and jaw. Shocking, electric "lightning" pains typically precede dull aching pain. Trigeminal neuralgia usually affects only one side of the face. The exact cause of trigeminal neuralgia is unknown, but it develops where the trigeminal nerve is compressed, pinched, or irritated. occasionally dystrophic changes. The onset of pain may be delayed, the commonest example being central poststroke pain (thalamic), which may start months or years after the initiating stroke. Pain is often of mixed nociceptive and neuropathic types, for example, mechanical spinal pain with radiculopathy or myelopathy. It is not generally recognized that nociceptive spinal pain can radiate widely, mimicking a root distribution. It can be difficult to identify the dominant pain type and treat appropriately. Such patients require careful examination, imaging and neurophysiological investigation. The mechanisms of NP are substantially different to those of nociceptive pain. Novel impulse generators develop at various sites, and these are not stimulus-dependent. In peripheral nerve, it has been shown that ectopic impulse generation (EIG) develops as a result of the expression of abnormal sodium channels. This can be modified by neurotrophic growth factors (a potential target for new treatments). Abnormal chemical sensitivities develop in damaged primary sensory neurons, notably to catecholamines. Whilst this can be readily demonstrated in experimental preparations, the clinical relevance remains uncertain. Degenerative and then regenerative changes in the spinal cord may lead to aberrant connectivity, and possibly a permanently reorganised, irreversible state. Damage at one level in the nervous system may lead to secondary pathophysiological changes at more rostral levels. This has important implications when targeting treatments for NP. Screening questionnaires are suitable for identifying potential patients with neuropathic pain, but further validation of them is needed for epidemiological purposes. Clinical examination, including accurate sensory examination, is the basis of neuropathic pain diagnosis. For more accurate sensory profiling, quantitative sensory testing is recommended for selected cases in clinic, including the diagnosis of small fiber neuropathies and for research purposes. Sensory examination - light touch, temperature, painful stimulus, vibration and proprioception. Motor testing tone, strength, reflexes and coordination. Look for autonomic changes in colour, temperature, sweating and swelling. Unfortunately, neuropathic pain often responds poorly to standard pain treatments and occasionally may get worse instead of better over time. For some people, it can lead to serious disability. A multidisciplinary approach that combines therapies, however, can be a very effective way to provide relief from neuropathic pain. Anticonvulsant and antidepressant drugs for example, pregabalin, gabapentin and amitriptyline may work to reduce symptoms in most cases. Some neuropathic pain studies suggest the use of non-steroidal anti-inflammatory drugs, such as Aleve or Motrin, may ease pain. Additionally, some people may require a stronger painkiller, such as those containing morphine and can be used if the patient does not respond to other therapies. If another condition, such as diabetes, is involved, better management of that disorder may alleviate the pain. Effective management of the condition can also help prevent further nerve damage.In cases that are difficult to treat, a pain specialist may use an invasive or implantable device to effectively manage the pain. Electrical stimulation of the nerves involved in neuropathic pain may significantly control the pain symptoms. TENS is effective in the treatment of painful peripheral neuropathy, and very low level laser therapy has been shown to be effective in patients with neuropathic pain. 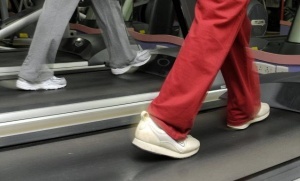 Keeping a consistent exercise routine will also help control pain. Regular therapeutic exercise will help you maintain the ability to move and function physically, rather than becoming disabled by your chronic pain. 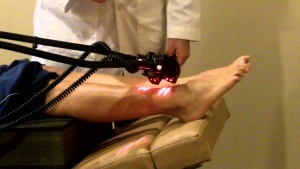 Although there is not much research on this subject, some article points out that low level laser therapy could help in the treatment of neuropathic pain. Physical therapy tackles the physical side of the inflammation, stiffness, and soreness with exercise, manipulation, and massage, but it also works to help the body heal itself by encouraging the production of the body's natural pain-relieving chemicals. This two-pronged approach is what helps make physical therapy so effective as a pain treatment. ↑ Treede RD, Jensen TS, Campbell JN, Cruccu G, Dostrovsky JO, Griffin JW, Hansson P, Hughes R, Nurmikko T, Serra J. Neuropathic pain: redefinition and a grading system for clinical and research purposes. Neurology, 2008; 70(18): 1630-35. ↑ Bouhassira D, Attal N, Alchaar H, Boureau F, Brochet B, Bruxelle J, Cunin G, Fermanian J, Ginies P, Grun-Overdyking A, Jafari-Schluep H, Lantéri-Minet M,Laurent B, Mick G, Serrie A, Valade D, Vicaut E. Comparison of pain syndromes associated with nervous or somatic lesions and development of a new neuropathic pain diagnostic questionnaire (DN4). Pain, 2005; 114(1-2): 29-36. ↑ Andrade AL, Bossini PS, Parizotto NA. Use of low level laser therapy to control neuropathic pain: A systematic review. J Photochem Photobiol B. 2016 Nov;164:36-42. ↑ Victoria Pain Specialists. Neuropathic Pain.